I know, I know, we're all trying to eat "better" and "healthier" now. It's what happens EVERY year. Don't worry friends, I've got you covered. 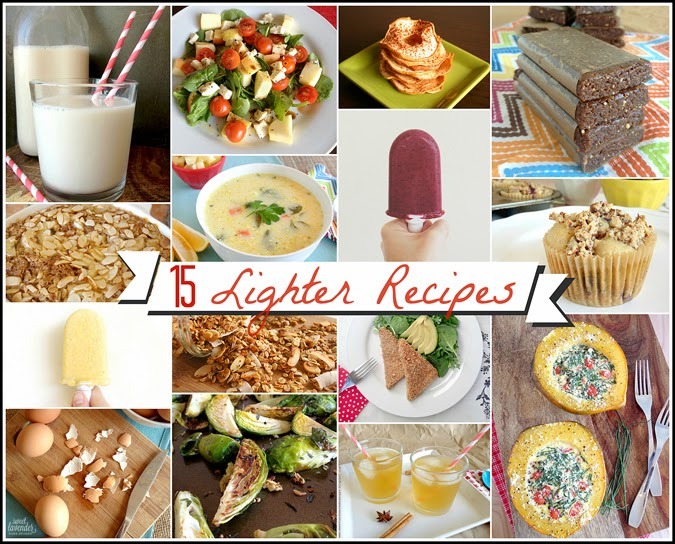 Here are 15 lighter and healthier recipes you can try! Why not get into the habit of making your own almond milk? This hearty banana almond baked oatmeal is filling and perfect for brunches with friends. We all still need dessert. Try making your own popsicles! They're easy! We love this spicy and salted coconut mango version. Stock up on protein with these perfectly easy medium boiled eggs. Packed with all sorts of nutrients, this easy spinach salad is a great dinner or lunch option. My husband and I LOVE this coconut curry soup with chicken and apples! We make it ALL the time! Don't forget breakfast! It's the most important meal of the day AND will help you have a great start (meal wise) to the rest of your day! Make a large batch of this coconut almond granola and eat it all week long. Pack in as many servings of veggies as you possibly can! We love this simple roasted brussels sprouts recipe. If you need a great "go to" snack recipe, these easy homemade apple rings should do the trick. NO sugar added and totally great for kids! Another great dessert option- blueberry buttermilk popsicles. Keep a few in your freezer for a quick dessert when you've got a sweet tooth. If you're trying to cut out meat, this spicy oven "fried" tofu should satisfy your palate! It's got Sriracha and hoisin. What's not to like? Ginger and green tea are great natural anti-inflammatories! If you've been hitting the gym a lot lately, you might want to help those swollen muscles with some of this ginger, star anise, and orange tea. It's delicious iced! Who doesn't love a Lara Bar? I know we do! Learn how to make your own chocolate peanut butter version and save yourself some serious bucks! These babies are gluten free and seriously yummy! Gluten free blueberry almond muffins. Get on em. Filling and satisfying- these baked acorn squash halves with a custard-like quiche filling couldn't be easier to make. Plus, they're totally delicious! These look DELICIOUS! I think I'll make some of that coconut granola this weekend. Thanks for sharing! It's a good one! I can't wait for you to make it :) You'll have to let me know how you like it!